From Minangkabau International Airport : Starts going to the south Jl. Adinegoro. Keep on street onto Jl. Prof. Dr. Hamka. From Teluk Bayur : Start going out to the north Jl. Merak. Turn Left onto Jl. Sutan Syahrir. Keep on street onto Jl. AR Hakim. Make U turn and keep left to take Jl. Baginda A Chan. Keep on street onto Jl. Sudirman. Keep on street onto Jl. Rasuna Said. Keep on street onto Jl. Khatib Sulaiman. Keep on street onto Jl. Prof. Dr. Hamka. End at Jl. Prof. Dr. Hamka No.2A. The concept of HW Hotel Padang building is classic-style design, with a modern touch. White and beige are the dominant color that represent clean and graceful atmosphere. Our interior design is set to give a homey atmosphere, complemented with convenience service and professional staff as in classy hotel manner. We are well-known for the food taste and variety throughout Padang area. And we are very welcomed our guest to enjoy the best breakfast in town. The Mercure Padang hotel is well located in the Padang city center. Enjoy shopping in the nearby shopping center or benefit from the Padang Convention Center. Whether visiting for business or holidays, this Mercure hotel offers an ideal base to explore the important landmarks of the city and various tourist attractions, and to conduct business. Counter For Reservation Hotels All Around Indonesia With A Reasonable Price And Kind Service. Set on the oceanfront with mountain views, this contemporary hotel is 4 km from both Al-Irsyad Mosque and cultural exhibits at Museum Adityawarman and 14 km from an iconic statue of Malin Kundang on Air Manis Beach. Chic rooms and suites come with free Wi-Fi, flat-screen TVs and some have ocean views; suites add separate sitting areas. Amenities include an outdoor pool, a fitness center, 2 meeting rooms and 2 convention halls. There's also a lounge and a laid-back restaurant. 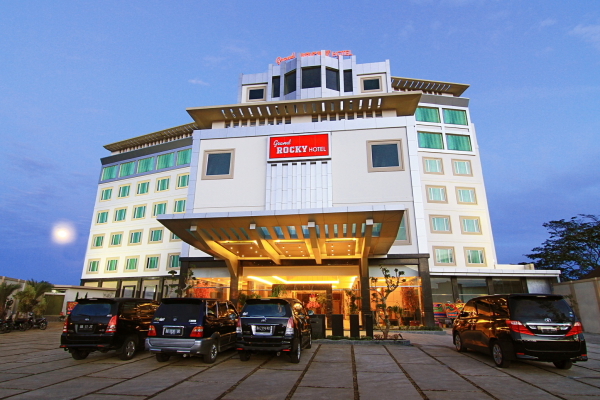 Grand Rocky Hotel Bukittinggi is located in the center of the mountainous town of Bukittinggi, only 70 minutes from Minangkabau International Airport. Walking distance from Jam Gadang (Giant Tower), as Landmark of Bukittinggi. 143 elegantly furnished guest rooms and suites with modern amenities and complimentary breakfast provide the travelers with comfort of home. Walking distance to dutch Fort de Kock, Museum & Zoo. Walking distance to Japanese Tunnel and Sianok Canyon. 10 minutes drives to Bukit Ambacang Circuit and New Panorama. 60 minutes drives from Lake Maninjau and Puncak Lawang (The road to the is famous for it’s 44) bends-each offring superb Panorama as it meanders down to the water edge.